…the benches outside Argos, a flyer. …Centre for Contemporary Arts (CCA) 5, the Theatre space. …spaces from the past merge with the present. The first project was Radio Tuesday (1999)—a collaboration between Mark Vernon, Duncan Campbell and Alex Frost. Beginning as a series of broadcasts, it then appeared in a gallery in Helsinki and had its third iteration at Transmission Gallery, Glasgow. The venue drew in visual artists where many had formative experiences of audio recording and editing, often using the purpose built studio. People can now easily access and use technology, studio support became unnecessary. 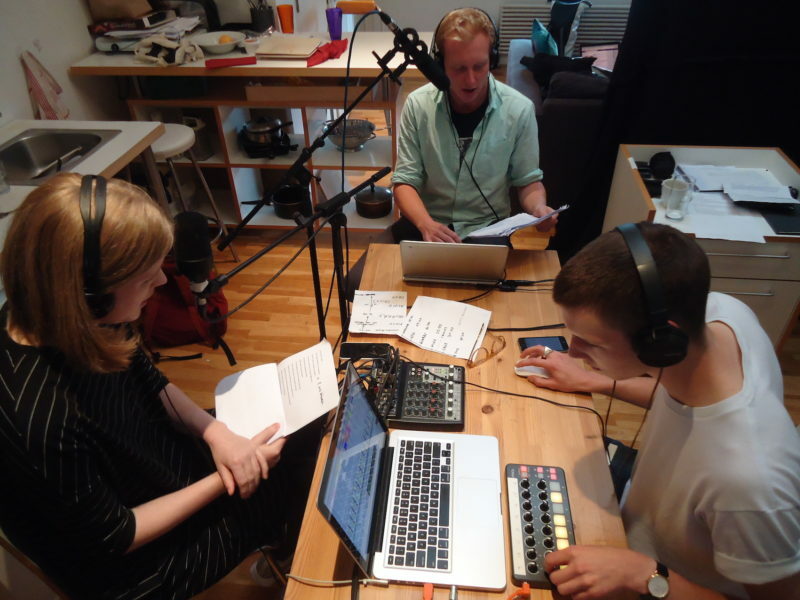 What remains, is the need to air what is perhaps too experimental or contentious for a conventional station, to maintain an expanded understanding of what radio, and art, can be. The flat upstairs in the CCA, used for artists’ residencies, slightly separate from the rest of the centre, still gallery like but also domestic. 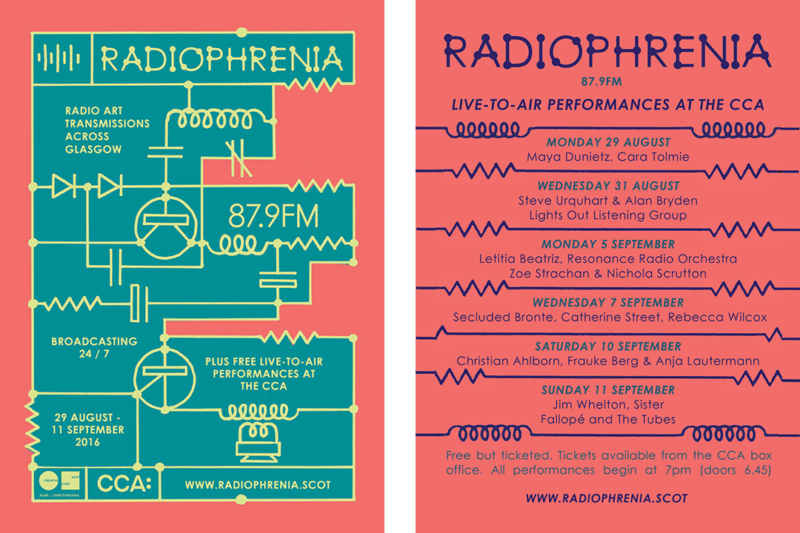 Last year Radiophrenia ’s week long programme featured nightly live-to-air performances and so they inhabited the Theatre’s green room. Technology, the new CAT5 network, allows media to infiltrate from the Cinema or Theatre, into the Flat, through the antenna then into the city or streaming through the internet. Glasgow’s been humid, the studio is warm. We overlook the reconstruction after May 2014’s fire in The Glasgow School of Art’s Mackintosh building; there’s lots of noise. It’s RADIO and some of the time, particularly during live broadcasts, the windows are shut. Daily rituals provide continuity and rhythm: Stephen Hurrel and Nerea Bello’s signature time check of Howler Monkeys in Mexico at noon and midnight; commissions first played at just after noon then repeated at 6pm; Carrie Skinner’s presence every day (except one) at 3.30pm—dressed in a dinner(esq) suit, dress shirt with white chrysanthemum on her left lapel—playing the Australian radio production of Frankenstein originally broadcast in 13 parts but often with interruption, ‘Victor, is there anyone there?’ The rest is less ordered, programming free from scheduling conventions. …in the air around ‘us’, these spaces of reception. Reception can be thought about in many ways. How do you listen to it? Is it out loud, merging with the air, or through headphones, isolated and in you? How do you, how do people receive the programme? What do they ‘make’ or think of it? A broadcast is an event rarely repeated on Radiophrenia : the British Library Sound Archive may come to hold the collection, but there’s no place to ‘listen again’. The absence of web archiving ties the project together—if you want to experience a specific piece you have to be listening. However, the schedule links to the artists and they determine what happens with their work. Some have made recordings available, such as Phantom Chips ‘Ghost Hunt’ or Stuart Gurden’s ‘Arena on Energy on Tape’, others are more elusive. Material has already been rebroadcast on Resonance FM, and it will be played at Radio Revolten in Halle, Wave Farm in Upper state New York and other yet to be determined stations. Radiophrenia is an accumulation, rather than an overarching theme or idea, brought together through a common medium: live events, produced commissions, live studio performances, compilations of short works, long form works, documentaries, field recordings, experimental music, sound art, drama, poetry and (perhaps mostly) lots of material that lies in between or beyond. 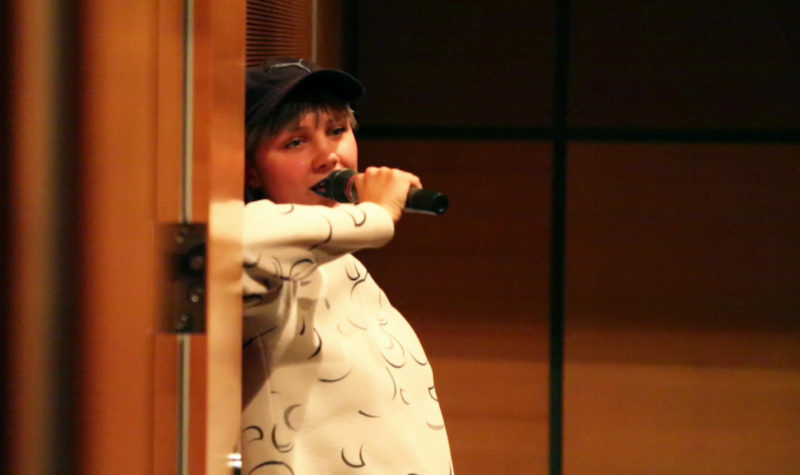 At times recordings blend together, at others they are punctuated by an announcer’s voice. Ongoing and literally refreshing, becoming anew with each work, each space of reception. Thanks to Barry Burns and Mark Vernon for providing information together with Barry Burns, Katherine MacBride, Sarah Tripp and Rebecca Wilcox for commenting on an earlier version of this text. Thanks to Sarah Tripp for this observation.